I happened to have an event I was heading to yesterday evening down at the Wharf, which is right across the harbor from Hains Point. 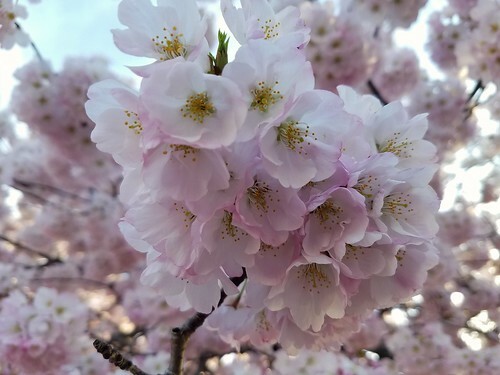 I’d hoped to check out some of the cherry blossoms, dock my bikeshare, and then take the jitney across, but there were no docks to be had, so I had to forego my admiring of flowers in order to keep biking to my end destination. We had some rain this evening or I would have gone back then. I may try again tomorrow afternoon or may wait and go on Thursday instead. It should still look lovely through the end of the week, when there will start to be more petals on the ground than on the trees and when the leaves start taking center stage on the cherry trees. 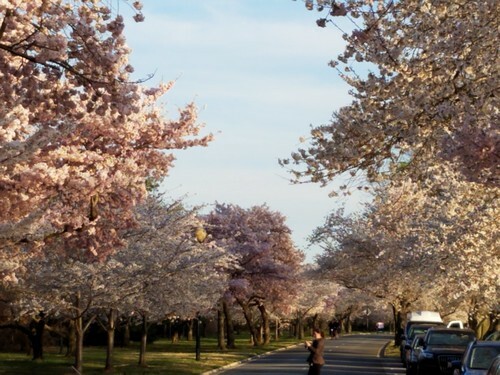 I’ve heard the Arboretum’s cherry tree collection is quite lovely and they’ve really been pushing it this year to the locals as a less-crowded, longer-lived alternative to the Tidal Basin area. I may bike over there one day, particularly since I’ve never been, or I may wait until next month when their azaleas are apparently something to be marveled at.